Fundraising – Bethany Public House | An American Grill and home to Bethany Brewing – a nano-brewery making a core set of true-to-style beers. NEED TO RAISE SOME MONEY? 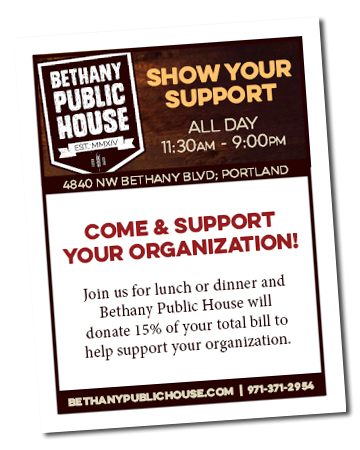 Bethany Public House offers a fundraising opportunity on Sundays from 9am-9pm, and Wednesdays from 11am-9pm. Raise money for your school, your team, or your charity of choice by having a portion of each meal purchased that day donated to your cause! PLEASE CONTACT TINA GRIFFIN TO SET UP YOUR NEXT FUNDRAISER! I consent to BETHANY PUBLIC HOUSE collecting my details through this form.